Canola plants with Sclerotinia stem rot. 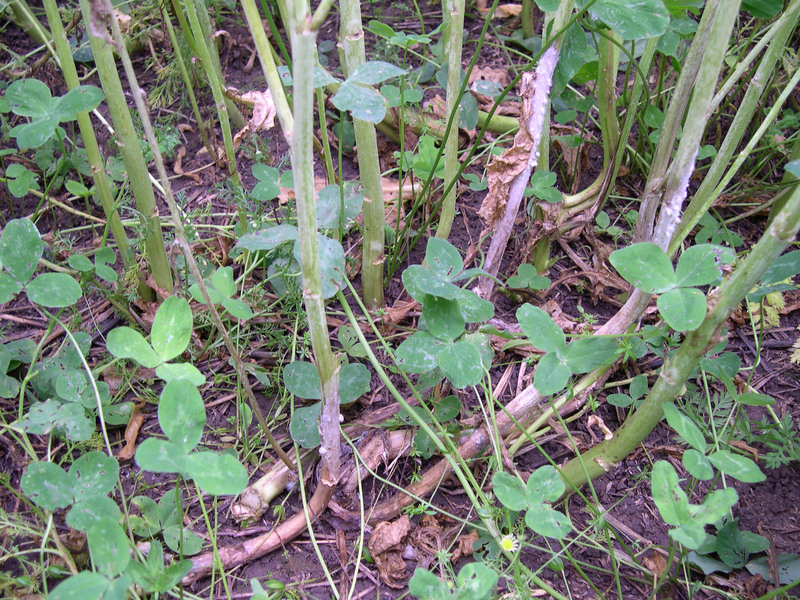 Canola plants with Sclerotinia stem rot, note that sclerotia are forming (white-colored) or have formed (black-colored) on the outside of the canola stem. Cause The soilborne fungus, Sclerotinia sclerotiorum, can attack many broadleaved plants, including common bean and canola. Sclerotinia is a serious problem on snap bean in the Willamette Valley. Carrot, chickpea, cucumber, clover, cabbage, cauliflower, lentil, field pea, potato, squash, radish are also susceptible but support less buildup of sclerotia in the soil. Many broad-leaved weeds are also susceptible, including lambsquarters, Canada thistle, ragweed, and marsh elder. Members of the grass family including small grains, corn and grassy weeds are considered immune. Sclerotinia stem rot can be considered the most serious disease of canola. After a moisture-conditioning period, the overwintering bodies of Sclerotinia (sclerotia) germinate to produce tiny mushroom-like bodies (apothecia), which produce millions of airborne spores. The spores can be produced not only in canola fields, but also in fields of other crops, including small grains. The spores escape from the canopy and may be windborne to nearby fields. Spores may infect senescent tissue such as blossoms and leaves or may germinate and colonize plant debris. After colonizing, the fungus can invade any part of the plant with which it comes in contact. The pathogen survives as sclerotia in or on the soil. Some sclerotia may survive as long as six years or more. Moist conditions within the plant canopy favor infection, as do rain, dew, and/or irrigation practices that keep foliage wet for long periods. Symptoms The disease is mainly on aboveground parts, producing a soft, watery rot. Diseased tissues eventually bleach white. Sclerotia that are black on the surface and white inside, associated with this bleached tissue, are diagnostic. On seed crops, stem infections can cause wilting and plant death, resulting yield losses. Affected plants may be more erect due to lack of pod fill. Rotate using nonsusceptible crops such as grass or grains. Encourage maximum air movement between rows. Chemical control According to research in North Dakota, fungicide applications for Sclerotinia control in canola are economic only when Sclerotinia has been a problem in the area, rainy/humid weather is expected to continue, and if canola yield is expected to be at least 2,000 lb/A when canola prices are minimal. Carboxamide (Group 7) formulations are registered for use. Do not make more than two (2) sequential applications before alternating to a labeled fungicide with a different mode of action. Endura at 5 to 6 oz/A at 20% to 50% flowering. Preharvest interval is 21 days. 12-hr reentry. Vertisan at 16 to 20 fl oz/A at 20% to 50% flowering. Preharvest interval is 21 days. 12-hr reentry. Quash (Group 3) at 2 to 4 oz/A at 20% to 50% flowering. The preharvest interval is 35 days. 12-hr reentry. Quadris Flowable (Group 11) at 6 to 15.5 fl oz/A at 10% to 25% flowering. Do not make more than one (1) application of any Group 11 fungicide before alternating to a labeled fungicide with a different mode of action. Preharvest interval is 30 days. 4-hr reentry. Biological control Studies in snap bean show that protective fungicides are still required as only a few sclerotia are needed to cause an epidemic in a field. Reference Lamey, A., and Bradley, C.A. 2003. Sclerotinia Stem Rot of Canola: Biology and Management. NDSU Extension Service PP-1201.